New Mexico is one of the more fascinating states in the country. It is one of the few places in the United States with a long colonial history. This mixture of cultures and natural beauty is what draw most travelers to New Mexico. Today there is also thriving art scene in Santa Fe and Taos, which draw artists from around the world. Along with the art scene is a hippy culture that has created interesting communes and even the 100% off the net work architecture style of Earth Ships. Although if looking for the old New Mexico it is not very hard to find, just step a little off the main tourist avenues and inhale the centuries old stories. The area was first settled by the Clovis culture people during the last ice age. As the Clovis culture began to die the Pueblo Indian culture was born. Starting around 900 AD the Pueblo culture flourished in New Mexico although it went through many different phases. The Pueblo people are a sedentary farming society that live in adobe homes with similar architecture. Don't be fooled, the different Pueblos have very different cultures with some languages being as different as Chinese compared to Spanish. Evidence of their great culture can be experienced at the ruins of Chaco Canyon or Aztec Ruins National Monument or the current day Pueblos of Taos or Acoma. In 1540 Coronado, a Spanish Conquistador, organized an expedition to explore the area for the mystical Seven Golden Cities of Cibola. What he found were the Pueblo cities. In 1598 Juan de Onate returned and founded the Province of New Mexico. The plan was to turn the different Pueblo tribes into surf like state with Spanish conquistadors ruling them. The harsh treatment of the conquistadors was only reenforced by the brutal tactics of the missionaries. This eventually reached a boiling point when in 1680 all the Pueblos united and lead the successful Pueblo Revolt, which pushed out or killed all the Spanish in New Mexico. An interesting result of the Pueblo Revolt was that many horses were released and went feral on the plains, which were later recaptured by plains and west coast tribes therefore spreading horses across North America. The Spanish returned 12 years later in 1692, this time lead by Diego de Vargas. The truce among the Pueblos did not last long and de Vargas returned order to the area. Although brutal at times he stopped the missionaries and set up clear boundaries between Spanish and Native areas. A key difference was before the Pueblo Revolt the Spanish moved into the Pueblos and tried to rule directly from there in many cases. De Vargas would establish a Spanish town close to the Pueblo, at the same time respecting their distance. Also at the same time the Navajos, Apaches and Comanches became more aggressive making it that the Pueblo tribes and the Spanish allied themselves for safety. Over the next 150 years the area became very isolated and was considered a backwater of the Spanish Empire. With the Spanish economy in decline the settlements along the Rio Grande were left to fend for themselves with little Spanish assistance. When the Mexican War of Independence ended in 1821 New Mexico was given to Mexico. This did little to help the area as even less resources were given to it. After the Mexican-American War, from 1846 to 1848, the United States took New Mexico and pretty much ignored it until after the civil war. After the civil the United States committed great resources in their own words "to solve the Indian problem." This lead to most tribes being settled on reservations by treaty or by force. During the 20th century New Mexico started to change and was made into a state in 1912. More anglo settlers have moved in and tourism has become a large part of the economy. The last major historic event that took place in New Mexico was the site of the first atomic bomb test in 1945. The state's total area is 314,460 km2). The eastern border of New Mexico lies along 103° W longitude with the state of Oklahoma, and 5 kilometres west of 103° W longitude with Texas. On the southern border, Texas makes up the eastern two-thirds, while the Mexican states of Chihuahua and Sonora make up the western third, with Chihuahua making up about 90% of that. The western border with Arizona runs along the 109° 03' W longitude.The southwestern corner of the state is known as the Bootheel. The 37° N latitude parallel forms the northern boundary with Colorado. The states New Mexico, Colorado, Arizona, and Utah come together at the Four Corners in the northwestern corner of New Mexico. New Mexico, although a large state, has little water. Its surface water area is about 650 km2. The New Mexican landscape ranges from wide, rose-colored deserts to broken mesas to high, snow-capped peaks. Despite New Mexico's arid image, heavily forested mountain wildernesses cover a significant portion of the state, especially towards the north. The Sangre de Cristo Mountains, the southernmost part of the Rocky Mountains, run roughly north-south along the east side of the Rio Grande in the rugged, pastoral north. The most important of New Mexico's rivers are the Rio Grande, Pecos, Canadian, San Juan, and Gila. The Rio Grande is tied for the fourth longest river in the USA. Central New Mexico - Situated along the Middle Rio Grande Valley and home to Albuquerque, the Central region contains most of the state's population. North Central New Mexico - This scenic mountainous region has many of the better-known tourist destinations of New Mexico, such as Santa Fe and Taos. Northeast New Mexico - Here, the Rocky Mountains meet the Great Plains. The Santa Fe Trail, railroads, and Route 66 all passed through here. Northwest New Mexico - Part of the Four Corners region, this area is home to many unusual geological formations, red rocks, and part of the Navajo Nation. Southwest New Mexico - Home to scenic low-lying mountains and much of the agricultural production in the state, along the Rio Grande. Southeast New Mexico - Elevation-wise, this is the lowest region of the state, mostly desert but with some strange geologic phenomena. Albuquerque - By far the state's largest city and the center of commerce for the state, with a fair number of tourist attractions in its own right, including a massive and spectacular hot-air balloon fiesta. Albuquerque also offers plenty of hiking in the Sandia foothills to the east of the city along with more trails on the opposite side of the Sandia range. Carlsbad makes an obvious base for exploring Carlsbad Caverns National Park. The city is full of hotels and restaurants ready to cater to tourists visiting this southerly corner of New Mexico. Farmington - The largest town in the northwest section of the state, and a gateway to the Navajo Nation and Four Corners area. Farmington is the best base for exploring the Bisti Badlands National Wilderness Area. Gallup has a well preserved section of Route 66, complete with old hotels and a few diners featuring authentic neon signs from the golden age of the American road trip. Las Cruces - The state's second largest city and the largest in the southern portion of the state. The omnipresent Organ Mountains provide a stunning backdrop to the city as well as opportunity for many hiking options. Rio Rancho has become a bedroom community of Albuquerque. This suburb is situated along the Rio Grande River and features many national retail establishments. Roswell - A medium sized town most well known for the alleged crash of a flying saucer near here in 1947. Today, Roswell's International UFO Museum and Research Center continues to draw in tourists from all over the planet. The museum features plenty of historical facts about the alleged crash in 1947 as well as relevant information on alien phenomenon from around the world. 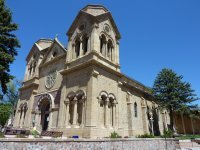 Santa Fe - The state capital and primary tourist attraction of the state, with historic architecture, scenic beauty, and a concentration of arts and culture. Silver City - An old mining town located in the southwestern section of the state, Silver City has become quite the burgeoning center for art galleries and hip culture in the last few years. Silver, as it is known to the locals, is also the gateway for exploration of the Gila Cliff Dwellings National Monument, reached by a winding road from town through the mountains of the Gila National Forest. Taos is an artist town with an amazing traditional Spanish town-square and Native American Pueblo outside the city. Visitors come here for more than art galleries and traditional New Mexican handcrafts; there is great winter skiing in the nearby mountains and great outdoor opportunities at the nearby Rio Grande River Gorge. Carlsbad Caverns National Park is located in the Guadalupe Mountains, roughly a 300 miles (almost 500 kilometres) drive from Albuquerque, New Mexico. The Caverns date back 200 millions years and the limestone rocks that holds Carlsbad Cavern are full of ocean fossil plants and animals from a time before the dinosaurs, when the southeastern corner of New Mexico was a coastline similar to the Florida Keys. One of Carlsbad Caverns main attraction is the “Big Room” where visitors can go down 900 feet (over 250 metres) in an elevator into the cave's main area and witness the wonderful rock formations. The Carlsbad Caverns are a must-see attraction that gets busy all-year around. Visitors are able to take a self-guided tour or a guided tour and tours can often be set up through hotels in the area and cities nearby. The Caverns are a UNESCO World Heritage site. The White Sands National Monument is a U.S. National Monument located about 26 kilometres southwest of Alamogordo in western Otero County and northeastern Doña Ana County in the state of New Mexico, at an elevation of 1,291 metres. 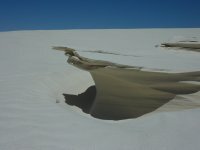 The area is in the mountain-ringed Tularosa Basin and comprises the southern part of a 710 km2 field of white sand dunes composed of gypsum crystals. It is the largest gypsum dune field in the world. Bandelier National Monument presents visitors a glimpse into village life for the Ancestral Puebloans. Here, kivas and other adobe structures were mainly concentrated at the base of a sheer cliff. This was an advanced center of population and agriculture was practiced in the narrow valley in which the village was built. Bandelier National Monument also has over 70 miles of hiking trails throughout it's 33,000 acres. Trails for all skill levels can be found from 1 mile loops to several backcountry trails exceeding 12 miles in length. In winter months visitors will find several trails suitable for cross-country skiing and snowshoeing. Chaco Culture National Historical Park is a stunning series of ruined settlements in the desert and a UNESCO World Heritage Site. A 9 mile, one way circuitous road passes through the heart of the park with stops at various points of interest along the way. There are 5 back country hiking trails within Chaco Culture National Historical Park, taking in ruined peublos not accessable from the road as well as picturesque views of the surrounding countryside from the ledges above Chaco Canyon. Limited camping is available throughout the year at the park's Gallo Campground. In summer and early autumn, free presentations on the night sky at Chaco Canyon are provided by park rangers, including chances to look deep into the cosmos with the park's super telescope. For more information visit the Chaco Canyon Night Sky webpage. El Morro National Monument located on NM Route 53 between Grants and Gallup, is a free visitor attraction spanning hundreds of years of New Mexican history and chronicles the many marks man has left upon this striking rock formation. That first mark involved the ancestral Puebloan Culture that built and maintained an adobe settlement atop the rock known as El Morro Mesa in the western New Mexican high desert from about 1275 to 1350 AD. The next group of people to leave their mark, in the form of etched signatures on the base of the sandstone mesa walls, were Spanish Conquistadors making their way through the countryside in search of the fabled cities of gold as well as new lands for the crown. The very first signature was made by Juan de Oňate, the first Spanish governor of the colony, dated April 16th, 1605. Many more signatures followed throughout the years including those of soldiers, guides, surveyors and settlers. Hundreds of signatures, dates and messages are still visible today and can be viewed from a paved walkway along the base of El Morro Mesa. Visitors to El Morro National Monument can also hike a circuitous trail from the visitor center to the top of the mesa to see the ruined pueblo and enjoy the stunning views of the surrounding countryside. Gila Cliff Dwellings National Monument is reached by a winding road through the Gila National Forest from Silver City, 38 miles to the south. From the visitor center an easy trail and a 15 minute hike leads to a natural rock shelter that provided people from the ancient Mogollon Culture an excellent building site. About 15 families lived in 5 caves within the boundaries of this 550 acre monument. Visitors can step inside the caves, observe the ruined buildings and even enter several rooms. There are hot springs located at a campground several miles south of the entrance to Gila Cliff Dwellings National Monument. Pecos National Historical Park is known to most visitors for the ancient ruins of Pecos Pueblo and the Spanish mission, known as Mission Neustra Seňora de los Ángeles di Porciúncula de los Pecos. 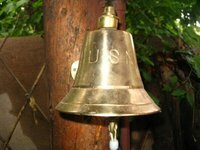 Lesser known attractions within the park include a section of the Santa Fe Trail as well as large portions of the battlefield from the the Civil War Battle of Glorieta Pass, fought March 26th - 28th, 1862. Another part of the park contains the old Forked Lightning Ranch, founded in the 1920's. Visitors wishing to see the battlefield must check with staff at the visitor center to gain access to a gated portion of the park. Here, interpretive signs highlight the key moments of the battle as well as the aftermath and what it meant to both the Union and Confederate armies. Petroglyph National Monument features 3 ancient volcano cones and the namesake petroglyphs etched into the scattered rocks produced by those eruptions. Visitors can climb the 3 volcanic cones which are easily accessible from the parking area off Atrisco Vista Blvd on the extreme west side of Albuquerque. Miles of hiking trails throughout the monument, along with stunning views of the Rio Grande valley, Albuquerque and the western slope of the Sandia Mountain Range make Petroglyph National Monument a popular destination for locals and visitors. Rio Grande Gorge offers scenic and recreational opportunities to visitors making their way to or from Taos. For scenic views from above, US Route 64 traverses the Rio Grande Gorge and provides dramatic views from a walkway along the bridge over the Rio Grande River 600 feet below. Recreation below the rim of the gorge includes hiking, fishing and the chance to soak in several hot springs along the riverside. Bisti Badlands is a 45,000 acre wilderness area south of the city of Farmington. Free access to Bisti Badlands provides plenty of opportunity to wander through a landscape filled with otherworldly rock formations and even a petrified forest, where plenty of ancient fallen tree trunks have turned to solid stone. Most noteworthy here are the mushroom-like formations of various sizes that seem to have been randomly placed upon the barren ground. Note: there are no trails to follow from the parking area of Bisti Badlands/De-Na-Zin Wilderness Area. All exploration of the area is unguided and it is easy to get lost - carry GPS, plenty of water and ample protection from the sun at all times. The International UFO Museum and Research Center has become a destination for many visitors to the state of New Mexico.This museum highlights the world famous alleged UFO crash from 1947 with historical accounts from the crash site as well as information on possible cover-ups from local officials and government agencies. There is a graphic depiction of the famous alien autopsy and a very extensive gift shop selling all sorts of alien-related merchandise. Bandera Volcano and Ice Cave - A collapsed lava tube within an ancient volcano offers visitors a chance to peer into a geological oddity. This collapsed lava tube forms a natural tunnel where the temperature never rises above freezing, forming ice from rainwater and snow melt throughout the year in the cave. A trail leads to the rim of the volcano and steps lead down to a large viewing platform. Picnic grounds, a gift shop, a small museum and several easy hiking trails make Bandera Volcano and Ice Caves a pleasant day trip. Taos Pueblo - a UNESCO World Heritage Site. The climate of New Mexico is generally semi-arid to arid, though there are areas of continental and alpine climates, and its territory is mostly covered by mountains, high plains, and desert. The Great Plains (High Plains) are located in the eastern portion of the state, similar to the Colorado high plains in eastern Colorado. The two states share plenty of similarities in terrain, with both having plains, mountains, basins, mesas, and desert lands. New Mexico's average precipitation rate is 350 mm a year. The average annual temperatures can range from 18 °C in the southeast to less than 4 °C in the northern mountains. During the summer months, daytime temperatures can often exceed 38 °C at elevations below 1,500 metres, the average high temperature in July ranges from 36 °C at the lower elevations to the upper to 26 °C at the higher elevations. Many cities in New Mexico can have temperature well belove zero. The highest temperature recorded in New Mexico was 50 °C at the Waste Isolation Pilot Plant near Loving on June 27, 1994 and the lowest recorded temperature is -46 °C at Gavilan on February 1, 1951. New Mexico receives a decent amount of snow as well, and a lot of snow in its higher elevations in the mountains. Albuquerque International Airport is the main gateway. Southwest Airlines offers most flights, including to/from Baltimore, Chicago, Dallas, Denver, El Paso, Houston, Las Vegas, Los Angeles, Oakland, Orlando, Phoenix, St. Louis, Portland, Salt Lake City, San Diego, Seattle and Tucson. Several other airlines serve San Francisco, Washington, D.C., Denver, Cleveland, Atlanta, Minneapolis-Saint Paul and (the only international flight) Chihuahua in Mexico. The The Southwest Chief between Chicago and Los Angeles, stopping in Albuquerque and a number of other places. The Sunset Limited between New Orleans and Los Angeles. The train only stops in Deming and Lordsburg in the extreme southwest of New Mexico. The Texas Eagle travelling between Chicago and Los Angeles. The train operates daily between Chicago and San Antonio, Texas, but only three times a week continues from San Antonio to Los Angeles, stopping in Deming and Lordsburg as well. Interstate highways 10 and 40 cross the state east/west, the former entering between El Paso and Las Cruces and paralleling the southern border, and the latter following the route of historic Route 66 through the middle of the state. Interstate 25 enters the state in its northeast corner near Raton, passes through the eastern plains, crosses the Sangre de Cristo Mountains at Glorieta Pass near Santa Fe, then follows the Rio Grande south through Albuquerque to its terminus at I-10 in Las Cruces. Although New Mexico has a fairly long border with Mexico, there are few ports of entry. Most traffic inbound from Mexico enters the United States at El Paso and then continues to Las Cruces and beyond. In addition to the usual customs, etc., at the national border, there are checkpoints along the major highways out of Las Cruces at which vehicles may be searched for illegal immigrants. (If you're considering bringing an illegal in, don't; penalties are serious and enforcement is stepping up, if still uneven.) The small town of Columbus has a border crossing with Mexico that is open 24 hours a day. Santa Teresa NM, adjacent to El Paso and south of Las Cruces also has a port of entry. Although this border crossing is only open from 6:00am-10:00pm, it forms a handy bypass of Ciudad Juarez and El Paso and is an important route for international commerce and travel. Greyhound has bus services throughout the country. New Mexico has a number of National Scenic Byways which offer a great way to explore the state crossing beautiful landscapes. Mostly, there are lots of national parks, state parks or monuments along the way and it's generally a better alternative than the faster but boring Interstate Highways. First and foremost, chile peppers. New Mexico chiles, despite their reputation, are generally not nearly as hot as habaneros and some Asian peppers, although their spiciness can still come as quite a jolt to the palate unused to spicy foods. Chiles are green for most of their growing life but turn red and dry out as they mature, and can be picked and cooked either "red" or "green." When you order a New Mexican dish in a restaurant, you'll be asked whether you prefer red or green sauce, referring to the color -- maturity -- of the peppers used to prepare the sauce. Green is usually hotter than red, but it depends on the seasons it was grown. They both have distinctive flavors; try both while you're here. The difference of red and green chile can also refer to how the chile will be served. In some instances, red chile will come as a sauce while green chile will come chopped or whole. (Incidentally, "red" chile has nothing at all in common with the red "chili" -- note spelling -- typical of Tex-Mex-style Mexican food, which is generally scoffed at in New Mexico.) The small town of Hatch, near Las Cruces, is famous for its chile farms, and is a good place to pick up some chile to take home. The sopaipilla, a light, puffy fry bread that can be served as a side dish or turned into an entree by stuffing it with meat, cheese, beans and chile peppers. The stuffed sopaipilla is perhaps the quintessential New Mexican dish and is most commonly seen in the northern half of the state (southerly restaurants are more likely to involve tortillas as the table bread, as in the cuisine of "old" Mexico). As a dessert, sopaipillas are often topped with sugar and honey. "Blue corn", which is just what it sounds like: corn in which the kernels, and resulting corn meal, have a distinctive bluish color. Tortillas made with blue corn differ from the usual tortillas not only to the eye but also to the palate, with a pleasingly gritty consistency and slightly "nutty" taste. Enchiladas made with blue-corn-meal tortillas are characteristic of Santa Fe and environs and have become trendy on a national if not world-wide level. Piñon nuts, the fruit of the scruffy little piñon pine tree that is widespread in the state. These can be eaten as snacks or as components of dishes, particularly some of the upper-end "Southwestern" cuisine. These components merge into a cuisine that ranges from utterly basic, everyday-lunch fare (served almost everywhere in the state) to incredibly elaborate "Southwestern" meals with any number of exotic variations and add-ons. Santa Fe is justly famous for its rich assortment of New Mexican and Southwestern restaurants, but don't eat New Mexican food just there; there are a number of subtle variations in New Mexican cooking in the different regions of the state (for example, topping enchiladas with a fried egg is characteristic of southern New Mexican food but rare in the north), and you'll be well advised to experiment locally. Albuquerque, Santa Fe and Las Cruces are the only cities large enough to have significant night life. However, several of the American Indian pueblos operate casinos that bring in name-brand entertainment. The casinos themselves are controversial locally because of problems with patrons with gambling addictions, but the entertainment can be reasonably good. There are a surprising number of acceptable wineries in New Mexico, concentrated mainly in the north central region, but there are several others in the middle Rio Grande valley, between Albuquerque and Socorro. The wine- and fruit-based beverage known as sangría, more commonly associated with Spain, is also widespread in New Mexico. Most restaurants with a liquor license that serve New Mexican cuisine will also serve sangría. This is version 70. Last edited at 14:23 on Mar 6, 19 by Utrecht. 50 articles link to this page.